Saints Alive had a very enjoyable and informative trip to JAARS in Waxhaw. The acronym JAARS stands for Jungle Aviation And Radio Service. JAARS is a multidisciplinary team of problem-solvers committed to the belief—and the vision—that people’s lives and communities are transformed as they experience God’s Word in their own language. 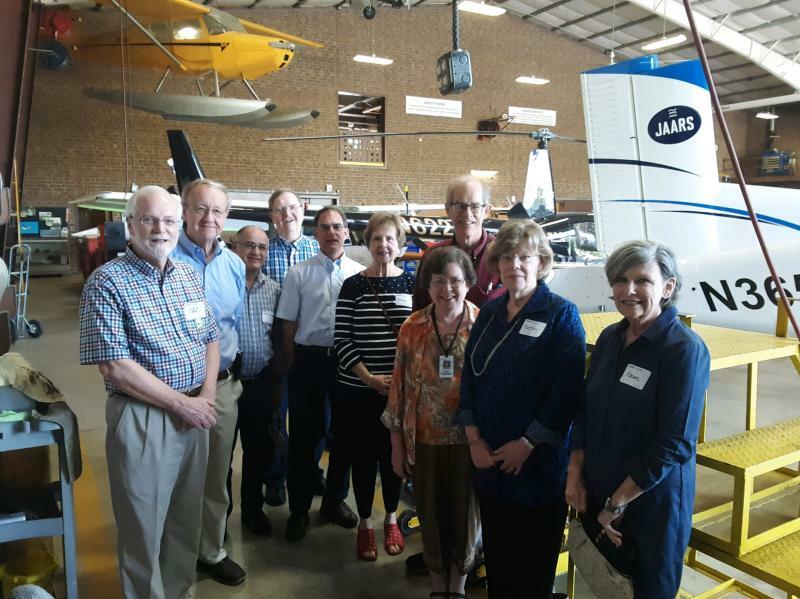 The group below enjoyed a delicious meal in the JAARS cafeteria and got to see up close some of the planes and helicoptors used in JAARS' ministry. FIRST PRESBYTERIAN is a congregation dedicated to Living God’s Word and Sharing God’s Love. With a variety of opportunities for Christian education, worship, spiritual growth, Christian fellowship and outreach ministry, we hope you will find your church home here. Experience the community of faith at FPC. Our hearts, our minds and our doors are open. Come worship with us and see how the Holy Spirit will work in your life.